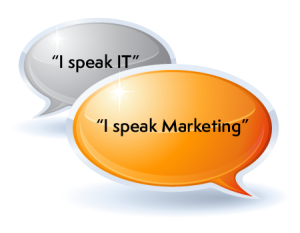 How often does the marketing department of a firm need to understand and utilize tools of technology today? The answer is-a lot. In this day and age, marketers need to not only understand the customer through research and surveying, but they also need to hone in on information in an organized way. Interpreting data requires many technical skills that often people do not realize. The ability to create graphs electronically, run data queries and utilize a slew of programs to assemble a perfect slide deck, are vital for marketers. In turn, the marketing goals of the business inherently shape the overall decision makers. You won’t find a marketing department in many of the larger firms without a CRM, or customer relationship management, software in place. These programs are often heavily customized during use to extract the most pertinent data collected through research of populations/customer bases, and analyzed for trending. A marketing professional must truly understand what information they are looking for and know how to get the information they need – i.e. know the software inside and out. Successful analysis requires core knowledge of a company’s current situation and department-wide goals, as well as some detailed IT-related skills. Currently, IT departments are working more closely with their marketing arms to understand the customer, as well as their separate channels and ultimate goals. By appreciating these factors, businesses can focus on how to approach customers and the most important products to invest time and energy creating. Organizing a unified goal among departments is key for businesses to prosper, and sharing this important information requires knowledge of technology and its programs.